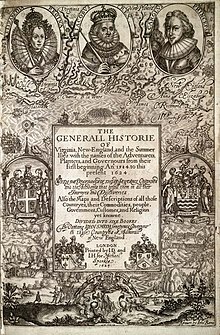 The Virginia Company refers collectively to two joint-stock companies chartered under James I on 10 April 1606    with the goal of establishing settlements on the coast of America. The two companies are referred to as the "Virginia Company of London" (or the London Company) and the "Virginia Company of Plymouth" (or the Plymouth Company), and they operated with identical charters but with differing territories. The charters established an area of overlapping territory in America as a buffer zone, and the two companies were not permitted to establish colonies within 100 miles of each other. The Plymouth Company never fulfilled its charter, but its territory was claimed by England and became New England. The Third Supply convoy encountered a hurricane which lasted three days and separated the ships from one another. The Sea Venture was leaking through its new caulking, and Admiral Somers had it driven aground on a reef to avoid sinking, saving 150 men and women and several dogs, but destroying their ship. The uninhabited archipelago was officially named " The Somers Isles" after Admiral Somers, though it was known as Bermuda. The survivors built two smaller vessels from salvaged parts of the Sea Venture which they named Deliverance and Patience. Ten months later, they continued on to Jamestown, arriving at Jamestown on 23 May 1610 but leaving several men behind on the archipelago to establish possession of it. At Jamestown, they found that over 85% of the 500 colonists had perished during what became known as the "Starving Time". The Sea Venture passengers had anticipated finding a thriving colony at Jamestown and had brought little food or supplies with them. The colonists at Jamestown were saved only by the timely arrival three weeks later of a supply mission headed by Thomas West, 3rd Baron De La Warr, better known as "Lord Delaware". To the disappointment of its investors, the Virginia Company of London failed to discover gold or silver in Virginia. However, the company did establish trade of various types. The biggest trade breakthrough came when colonist John Rolfe introduced several sweeter strains of tobacco  from the Caribbean,  rather than the harsh-tasting kind native to Virginia. Rolfe's new tobacco strains led to a strong export for the London Company and other early English colonies, and helped balance a trade deficit with Spain. ^ Gayley, Charles Mills (1917). "Shakespeare and the Founders of Liberty in America". Internet Archive. Retrieved 2018-11-30.